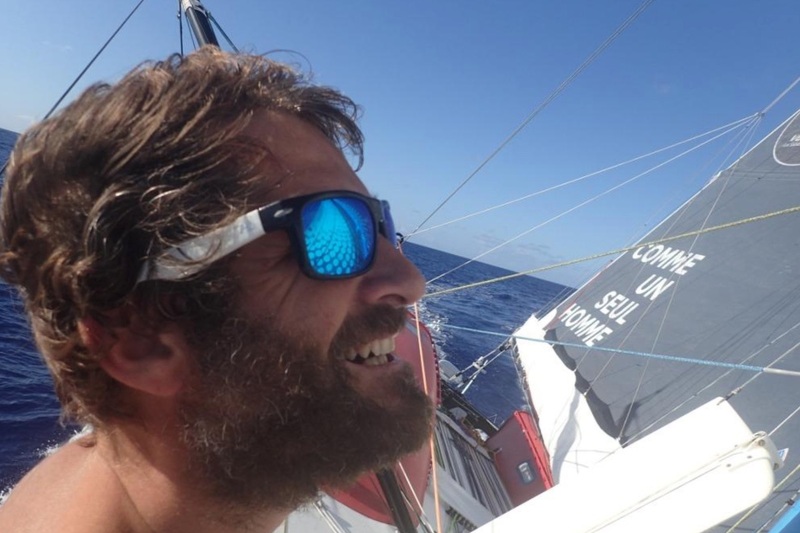 The willingness to go towards the other seems absurd and yet it is what I am experiencing in the middle of the longest solo race there is: the Vendée Globe. A statement of failure, which led me to swap my role of skipper for valid/disabled teams or men and women who are all different for the one of solo racer. For fifteen years I have been relentlessly trying to prove how our differences can be the key to innovation, performance and collective happiness if we try hard enough. I, who hate boxes, have been placed in the box of diversity without me noticing. The one that automatically excludes, where all those who aren’t “lucky” enough to superficially meet the current norms in force in our society are categorized. A vertical norm, masculine, white, not too old and not too young. Why talk about diversity. It doesn’t make any sense since we are all different! I, who wanted to talk about management, performance and collaboration by sharing failures as much as accomplishments, found myself invited by companies only during the handicap week to speak in front of tiny crowds of believers where I invariably received the “Coup de Coeur” award hastily invented by a festival jury because “we still have to give something to these poor disabled people…” Needless to say that this was a bitter realization. Nobody listened to me. Fifteen years of spending crazy amounts of energy to open our eyes to differences and for what? Nothing or so little. Like in quicksand, the more I fought to express a pragmatic view that would add value for everyone, the more they made me endorse the role of big-hearted captain. Good-sentiments are a catastrophe when dealing with differences. They focus on our visible differences by distracting us from our potential invisible similarities. I had to take all these fine people in the rear. Do something that would draw the attention of the public. 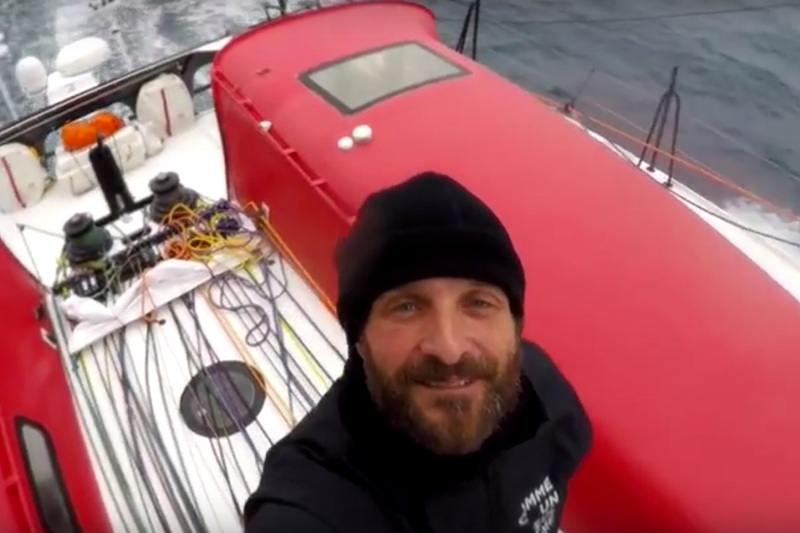 The most reachable and newsworthy thing was the Vendée Globe. It was sheer madness, back then. I am not a great sailor, and I had never sailed solo in my life. But I was hoping that by making it with the panoply of hero solo yachtsman, people would sit down and really listen to me. I thus went for it in 2014. Within one year, fourteen patron companies joined COMMEUNSEULHOMME. Their employees were invited to sail on the boat. They first come to meet the adventurer and his mount but leave proud of seeing their company involved with such an action. COMMEUNSEULHOMME isn’t bound to the names of the companies. It isn’t anybody’s boat but instead, it’s everybody’s boat. The 80,000 employees of these 14 patrons can all say, “it’s our boat”! In a year and a half, I’ve touched more people than in fifteen years of testimonials. And principally decision-makers, recruiters, managing committees and finally all those who do not go to the “handicap week”. It is at the heart of these companies’ most powerful events that I give speeches nowadays. Their presidents habitually invite me to speak in front of their employees who are often gathered for the first time. One of the patrons swapped his old values to replace them with the five action principles of COMMEUNSEULHOMME: bet on diversity-trust-innovate through constraint-aim at collective performance-revel as a team. The success goes beyond my dreams. The message on differences finally made it out of the freaking “diversity” box. Today we talk about it as a key factor of innovation, success and collective happiness. I have reached my first objective. But I won’t stop here! Meanwhile, we had to get ready for the race. Michel Desjoyeaux took the sporting project under his wing and a great team was born. 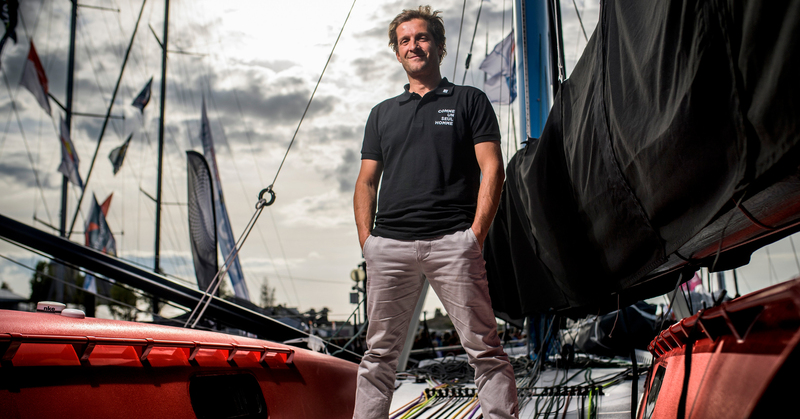 We arrived at the village of the Vendée Globe at the end of October and since then COMMEUNSEULHOMME raises awareness. A boat that isn’t selling anything on a race where banks, insurances, food industries or else are rushing to, kind of jumps out at you. The public and the media stick to the adventure. The Facebook page went from 7,000 to 35,000 followers. The tone charms people and the speech hits the nail, especially when it’s shared. The followers express themselves on differences; I am not the only one who hates the word “diversity”! The plea we launched on appelpourladifference.org gets bigger and bigger. If it is with similarities that great teams are built, it is with these as well that you bring a nation together. Today in France, in order to counteract the speeches of hatred and fear that proliferate, we unfortunately only have sterile angelic speeches as a weapon to fight back. The problem is that very few people really bet on differences because it is the hardest thing to operate. Working with different profiles demands time and energy, maybe also generate conflicts at times, to create common grounds. Discourses that deny difficulties are worse than speeches of hatred and fear because they insidiously feed them. Our political leaders, for example, struggle with diversity as a source of richness, because in the practice they actually knowingly cultivate self-segregation. COMMEUNSEULHOMME is the humble voice of those who give the difference adventure a try every day without being stopped by fear of failure. Our differences, if we add fierce and pragmatic willingness, are the only way for us to be happy as a collective. And this is undoubtedly the most beautiful adventure. NB. I am in my third week of the race and all’s well aboard.